As I mentioned in my article about Peter Max, there were several less widely known artists who were actually much more instrumental in the creation of that unique blend of Op, Pop, Surrealism, Dada and Art Nouveau that came to be known as Psychedelic Art in the 1960’s. Rick Griffin was one of the major contributors to this style, and is considered one of the “big five” along with Alton Kelley, Stanley “Mouse” Miller, Wes Wilson and Victor Moscoso. The canvases of the psychedelic artists were concert posters, record album covers and comix (underground comics). Griffin was a standout in all three areas. Griffin came out of the California surfer culture and created an influential comic strip character called Murphy, whose adventures he chronicled in Surfer magazine. In Los Angeles he fell in with a group of artists and musicians called the Jook Savages, and was a participant in the legendary Watts Acid Test held by writer and psychedelic pioneer Ken Kesey and his Merry Pranksters. Influenced by the radical new poster art of Wilson and, in particular, Kelley and Mouse, Griffin moved to San Francisco and joined them in creating posters for the burgeoning rock concert scene, working for promoters like Chet Helms and Bill Graham. Wilson and Kelly created their poster designs largely with typography and collage [I stand corrected, see the comment on this post from Wes Wilson], but Mouse and Griffin could draw like gangbusters and sparked the art of the poster, which was undergoing a revival in America in the 1960’s that rivaled its impact in the Europe before the turn of the 20th Century, to new levels of experimentation and dazzle. Like his contemporaries, Griffin was influenced by Victorian and Art Nouveau typography and took the styles to wonderful graphic extremes. The type in psychedelic posters was deliberately exclusionary; if you didn’t “get it”, you didn’t need to read it. 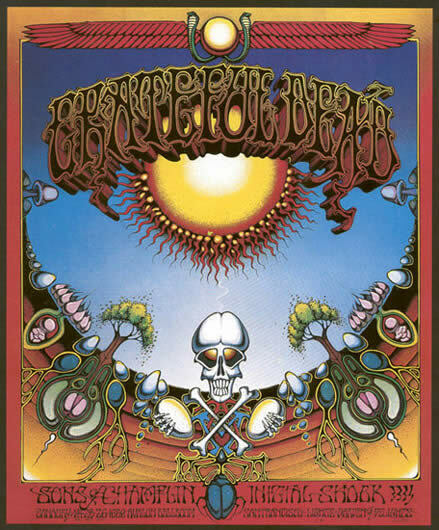 Griffin became associated with the Grateful Dead and created some of their most recognized posters and album covers. The image above was used both for posters and for the cover of their palindrome-titled Aoxomoxoa LP. Griffin’s art rewards close inspection. The image above, despite the overt skull and crossed bones, is full of symbols of fertility, conception and birth (or re-birth). Take a close look at the “sun”. Griffin was also a major presence in the underground comix scene, appearing in early issues of Robert Crumb’s ground-breaking Zap Comix, which set the standard for a subsequent wave of outside-the-box experimentation and wild abandon that expanded the boundaries of the medium (and laid the groundwork for the web comics of the 90’s). Griffin also created his own Tales from the Tube psychedelic surfer comix. For several years the main presence on the web for Griffin’s art has been the Rick Griffin Galleries maintained by Tim Stephenson. The site has recently been redesigned and improved and features galleries of Griffin’s posters, album covers, comix, early surfer art and the Christian art that marked his devotion to Christianity in the 1970’s. There is also an excellent bio, page of remembrances, and list of links to other web resources about Griffin. There is now an “official” site maintained by Griffin’s family, that also has galleries arranged by topic, a short bio and list of links. There is an extensive selection of actual posters from Wolfgang’s Vault. I’m remiss in not timing this post better, in that an exhibition of Griffin’s work, titled Heart and Torch: Rick Griffin’s Transcendence has just ended at the Laguna Art Museum. There is a MySpace blog created to accompany the exhibit. Additionally published to accompany the exhibit is a beautiful new large format book, also titled Heart and Torch: Rick Griffin’s Transcendence, written by Doug Harvey. An earlier, and also excellent book, simply titled Rick Griffin, by Gordon McClelland has been republished. You can also find his work in Psychedelia: The Classic Poster Book by John Platt and Off the Wall: Psychedelic Rock Posters from San Francisco from Thames and Hudson; and, of course, in reprints of Zap Comix, and, if you can find it, Tales from the Tube. Griffin designed the poster for the “Human Be-in”, a watershed counterculture event in January of 1967. The brilliant colors and mandala-like repetition of elements in his poster and album cover art were influential on many artists of the time and in later generations. The psychedelic artists of the 1960’s had a profound influence not only on subsequent visionary artists and the recent wave of so-called “Pop Surrealism”, but on the digital artists of the 1990’s and beyond. I was first introduced to the art of Rick Griffin in 1997 when I attended my first international calligraphy conference in San Diego. Carl Rohrs, exceptional calligrapher, gave a lecture on Rick Griffin. Wish I could show you Carl’s work but could not find a web site for him. I also appreciate the articles on web sites. I have a few more tweaks to do on mine thanks for the help. Through Him, whatever Him, By God He Was The Man. Griffin also.